This is the page to update you with our latest news. We thank all those who make donations. These are all forwarded on to Kenya. Your gifts particularly help to support many who work for the spread of the gospel in Kenya and without your support they would not be able to do this work and they and their families would suffer. We are writing on behalf of the various brothers and sisters in Christ in different parts of Kenya who are going through a severe famine. It is sad to report that the government of Kenya has refused to publicly acknowledge that her citizens are dying of hunger especially in Turkana. A few reports soliciting for humanitarian help can be read from Red Cross. Relief web and others who have reported of the situation in Marsabit (we reach out to Rendille community in this area) Turkana, Pokot and the Coast (Kilifi) which are seriously affected. I spoke with Joseph Ogom, one of the leaders of the church in Korr, Marsabit County, yesterday morning and he painted the gloom picture for me. He said that the animals are too weak and most of them are dying now due to lack of pasture and water. Those that are alive are being sold for as little as $5, which otherwise could be sold for $40-$50! These means that people have no milk or meat because the animals are nowhere near and for those near they are not worthy much to buy food (there is no other agricultural activity in these areas due to drought). I asked him how best to help, and he said that it would help alot if we can give them anything to buy food for the Church members and if possible give to the rest of the communities. Isaac Erot, who leads the church in Katilu says that the situation there is so bad that the people are eating anything to survive. A large number of livestock has already died and people are so hopeless, being without food. He says that going out to the area where they have a weekly Bible study without food to give to the people makes him grieve. He has had to literally close his eyes because of the people who are dying, yet has nothing to give them. Whenever these people see a visitor in the village, they hope that he will come with some food and water for the children. If he has nothing, they feel betrayed as their hopes are dashed. This means that they would not be available for the Bible study that he conducts. So if there is any help that you can extend either individually or as a church, or group, we shall do everything possible to add it to our own contribution at TBC Nairobi and make sure that that it gets to the hands of our brethren in these places. May the grace of giving abound for the course of the gospel of Christ, for the glory of God and good of his people. Although the School is run by the Government, the Board Chairman is from the Church, and the Church is able to have a Chaplain and frequent access to the students for spiritual help. Eventually there will be four classes with a total of 100-150 students. What a wonderful opportunity to influence many young lives with the gospel of Christ. The Church sponsors two other Secondary Schools in the area, at Kasei for boys, and at Kamketo for girls. Every year we are able to organize a Challenge Weekend in each School where brethren from Nairobi have been coming to bring sustained preaching. We are continuously thankful to those who give monthly to support various aspects of this work. C. Means of transport, the ministry is growing so it needs means of transport that it may make the work accessible. For example places like Nakuyen – to reach there, there must be a motorbike available. You may say ‘Chepkinagh have one’, but you see the ministry is big and we have two pastors to serve eight congregations including the new one which is Nakuyen. So you see it is a challenge serving 8 congregation and Nakuyen the new one with a single motorbike. Brother make this prayer request as a priority. – Form two – 23 and form One 17 total of 40 students by now. Priority need is at least to have two classrooms and one dormitory; others will follow later. – 4 Matrons for Wasat, Kapkoghun, Nakuyen and Tarakit primary schools. – Need four teachers for Apur, Nakuyen, Kuirer and Kapyomot primary school. – Nakuyen requests two classes because they have 5 classes against 7 classes and a population of 250 students. The area is highly populated compared to the other areas. The school is situated at the border of Kenya and Uganda and the communities are nomads. They move from the place in search of water and pasture. The community is requesting for boarding facilities like a dormitory so that when the parents move the students are left at school. Kindly make this need urgent. Listed below are a number of new projects which we hope we can raise funds for. They are listed in order of priority as agreed with the brethren in Nairobi. 5. Kericho: David Ng’etich needs at least KES. 20,000 per month to pay rent for his family and meet a few other needs. Are we able to raise at least £250 for him for two to three years? 13. Motorbikes (two in Pokot and one in Korr): Need fuel, service and other needs at a cost of not less than 5K per month. We do not have an income for this. £40 each. As from Sunday 18 March 2018 Keith Underhill stood down from being one of the pastors in Trinity Baptist Church, Nairobi, the church he established by the Lord’s grace some 40 years ago. Please pray for the church, especially Murungi, as it has now entered this new phase. This is an edited report made by a young man who accompanied Keith on his recent trip to Kenya and who has stayed on to see more of the work that goes on. I have been sent out to Kenya for 3 months to visit mainly Trinity Baptist Church Nairobi, but also many other associated churches. For the first week I was taking part in the TPC course. It runs from 9:00 in the Morning to 5:00 in the Afternoon. The course is on Pastoral theology and the main aim of the week appeared to be to show the students how hard the work of ministry really is. Pastor Keith laid it on hard. It was also to show them-many of whom are already pastors- the practical issues which will arise in the work of a pastor and how to deal with them. All the students are very friendly and I have been interested to talk to them about their ministry. One man, X, has had a very hard time in his ministry as one of his elders betrayed him and caused division in the church. This appears to be a big problem in Kenyan reformed churches. Yet he has stayed faithful and is still full of joy in Christ. He is able to support his family through his owning and supervising the growth of a number of goods in his ‘Shamba’ up country. Bananas, cabbages, etc. I have met Pastor Murungi’s family.They are a very pleasant family and have been very welcoming-Charity cooks some amazing food! On the Saturday, we went out to evangelise, we focused on a slum because the people there are most receptive and happy to listen. It is incredible how you can walk up to anyone and talk to them about Jesus and the Christian faith. We spoke to five groups of people, 4 of the conversations were in Swahili, so I could only speak through translation; but one of the conversations was with a group of drunk men and was in English-so I was able to get stuck in. Sunday was excellent. A full day of church, starting with adults Sunday school and moving on to a service. Then there was lunch, more bible study and another service. All the people are very welcoming and I had lots of good conversations. The course finished on the Wednesday, and so we set of early on the Thursday to Bumala for the RBAK, and then on to Pokot the next day. 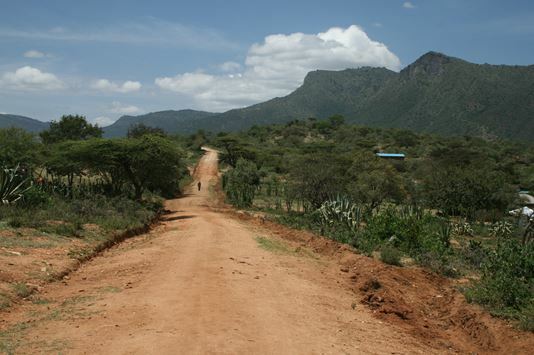 Pokot has some stunning scenery. Countless large, rolling hills covered in bush(short trees), the soil is brick red and only high up, very fertile. There are areas where the bush has been cut and the land is being used for agriculture, it is brimming over with livestock- goats, sheep, cows, camels, dikdiks (small antelopes) and of course with many insects; on one of the first days I saw a cricket the size of a small fist. We visited nine separate places, all of course very rural with many of the children having never seen a Mzungu (white man) before. The people were extremely welcoming. Even though they had never met me before they were thanking me for coming and talking to them and asking me to come back soon. Most people remembered Dad and asked me to send back greetings. It was encouraging to see how many churches there are-13 in all. I was able to give my testimony a number of times, to people personally and also to schools. Trinity Baptist Church sponsor a number of schools there which means they have the privilege of teaching them the gospel, as much as they want. For example, the morning after we arrived I was able to give my testimony to a school of about 250 boys. Sitting down, drinking tea and chatting is a very prominent thing in Kenya, so I got the opportunity to learn a lot, and to witness to a lot of people about the gospel (often through translation), some of them had never heard the gospel before. I have learnt a lot from Keith about witnessing to people in Kenya, it is very different because almost everybody would say they are a Christian, and everybody believes in God. The acceptance of people with regards to what I say to them is amazing, they always thank you for explaining things to them! Keith preached a lot, and the other young man with us-Gaitano Mbati spoke a lot as well to the primary school children. It was a privilege to be involved in such a trip where so many people heard the gospel and so many people were exhorted and helped. We were guests, and so in Kenya that means we were treated like royalty. The food was delicious, we had goat or chicken almost every meal. Chai was prepared constantly, and for breakfast at one of the places, we were given pancakes with wild honey, straight from outside-delicious! The people there are so thankful to Keith for the gospel which he brought to them. I found the camels fascinating, because I had never seen any before in real life- they allowed me to milk one. I just love being able to go outside to brush your teeth at night and being able to find a group of camels just chewing passively. Please pray for the pastors out there, that they would have zeal for the spread of the gospel throughout the area, some places which have never heard it before. The main ministers are- Andrew, Thomas, Joshua, Patrico, Isaiah, Peter, Samuel. It may be downloaded and printed. We wish to thank all those who have given to support this work, whether by regular donation or as a one-off. We thank all who have given already, and those who give on a regular basis to support the various needs. We are still working to cover the remaining needs for the Pokot area this year. However the needs for the Rendille area are also great as around £800 per month is needed. The needs are greater than what we are currently able to support, and so regretfully we have to say no sometimes when requests are made, despite many of these requests being of crucial importance in the lives of those who make the requests. The fall in the value of the pound is making a difference, as the number of Kenya shillings now being received when the money is transferred is now less than a few months ago by about 15%. Thus every £1 is now worth only about 85p. a house for Samuel Wafula, the worker in Chepkinagh who assists Andrew. This will cost about 100,000 shillings (around £800 / $1000). a meeting place at Kiwawa where a new work is developing, which will cost around 60,000 shillings (around £500 / $600). the need to refurbish a dormitory for the girls at Kamketo where another 200,000 shillings is needed (around £1,600 / $2000). 250,000 shillings has already been provided. One of our trustees recently made a visit to Kenya alongside Keith. Cliff Barton went with the intention to visit the church in Nairobi, to visit churches and schools in Pokot North, and to attend the Association (RKAK) meeting in South Nyanza. All over are very many different needs, both spiritual and financial. There are problems that need to be faced and also encouragements. I arrived in Nairobi late in the evening on Thursday 8 September. The next few days were spent talking to people around the church compound, sitting in on the TPC, and visiting church members with Keith in the evening and enjoying dinner with them. On Wednesday 14 September at 3pm, Keith, myself and 5 students from the TPC left Nairobi, taking the brand new perimeter road around Nairobi, thus saving much time avoiding traffic jams. We spent the night in Eldoret with 2 church members who are temporarily living there for work reasons. The next day we continued into West Pokot, arriving at Joshua’s in Kasei after 6pm. After eating we had an outdoor meeting with over 30 people present under a full moon. The following day, Friday, started with a drive up to Kapterema, visiting the primary school, and a meeting with the small group of believers there. Later, back in Kasei there was another late outdoor meeting. On Saturday there were morning meetings in the church building at Kasei, first speaking to the children and then the adults. We then went across to the Boys’ Secondary School with the opportunity to preach to the students. There are now 253 students in the school, which is now completing its sixthyear. After lunch at the school we descended to Kamketo and talked with the leaders about the needs there. On Sunday we went across to the school hall for the church service. This was attended by the church members and pupils from both the primary (now only girls) and the new girls’ Secondary School. The secondary School is now completing its second year with good results so far. There are 40 girls’ of whom about 10 are from the church. New Government ruling says that the pupils in secondary schools have to follow the teachings of the sponsor. This means that there is complete freedom to promote the gospel with these girls. The next day, Monday, we packed up early, and drove along one of the many typical dirt roads to meet the main (dirt) road. At around 10.30 am we went off the main road for about 1 kilometre along an undefined route and parked up. We walked for around 10 minutes and there were a couple of tree branches set out horizontally as seats. It was here that the gospel was preached, some people there at Kiwawa have asked for the good news to be brought there. After 3 hours, after rice, goat and tea, we left and continued on to Chepkinagh where we visited the primary school and spoke to the pupils. After eating there was a meeting in Andrew’s house for the local believers who were able to be there at that time. Tuesday was to be a strenuous day as it was the day we climbed up to Tarakit. We set out at 7.30 am while it was cooler, and took over 3 hours to ascend a height like climbing Snowdon in North Wales. There is still no road up to this place and the school is short of classrooms and desks. Water is from a spring about 1 km away. We preached to the school children and then in the church building to people from 3 churches in the area. The day concluded back in Chepkinagh with a late meeting at 10 pm..
Wednesday 21 September was to the last full day there. We left by 9.35am and drove to Apur where a group of around 35 children were spoken to and then the adults. By 1.50 we arrived in Wasat, but continued on a newly dug out road to Kwirir, where 3 years ago we had had to walk to reach there, and where the gospel was preached for probably the first time. Now there is a group of believers there. There is a further group of people over an hour’s walk away who want the gospel, and also more 4 hours away. From the beginnings at Wasat 8 years ago the gospel is now spreading to unreached areas. After returning to Wasat for the night we ate and there was another late night meeting at 9.15 pm. You will be very pushed to find any of these places described on any sort of map. Water is scarce. Much of the area is semi-desert. The people keep goats, sheep, cows, chickens and some camels. Maize does not always yield a harvest on the higher ground. Life is hard. Yet the Lord has His people there. Pray for the strengthening of the churches there and for more conversions. The next day, we left early to begin our journey southwards via Kisumu (Kenya’s third largest city) on the edge of Lake Victoria to attend the Association meetings at Osani in the south west of the country. The association consists of a group of churches throughout the country which subscribe to the 1689 Confession of Faith. For 17 years he was a preacher of Word of Faith doctrines despite his life experiences practically denying the very thing he preached. The Lord so graciously transformed him and has opened wide opportunities for the preaching of the truth. Having so many contacts among Word of Faith leaders, he runs an annual Reformation Conference in 3 venues, and gathers scores to give months of teaching in his Wisdom Training Centres. Arriving at Osani late we enjoyed tea and bananas. The next day most people arrived. We visited the place where the first contact was made, and, incidentally, where a village 500 years old had been discovered. Saturday was a day of ministry relating to the doctrine of the church and the first session of reports from some of the churches. Sunday was a day when the delegates and the church at Osani and believers from other nearby churches met together, followed in the afternoon by a Communon Service, and then the second session of reports from the remaining churches. There was prayer for the needs of each church. Monday was the day for the business matters of the Association. We are pleased to be able to say that as a result of a number of generous donations and regular commitments, all the required funding for all the teachers detailed below is now covered for this year. A big thank you to those who have helped in this. We are now in the process of seeing how we can cover for 2017, and so we will be pleased to hear from you in relation to this. There is already some funding in place. This is the latest situation in the schools in Pokot. There is a severe funding shortage and the church in Nairobi is unable to continue to provide the funding needed. This is what must happen on the assumption that there is no more funding. If funding is forthcoming action can be taken to reverse these difficult decisions. Following are details relating to the different areas. KWIRIR– The ECD will have to close and there will be no education in this village. Cost monthly for 1 teacher is £20/$30. The total for the school each month is £20/$30, the total for 2016 is £240/$360. APUR & KAPYOMOT– Only the ECD will continue with a government teacher. The 4 classes of the primary school will have to close, that are presently taught by just 2 teachers at £25/$35 monthly each. Total for school each month £50/$70, for 2016 £600/$840. TARAKIT– This has 4 classes of the primary school, with 1 government teacher, and 5 supported by Trinity. It would have to shrink to ECD and only class 1. The total for the school each month is £115/$165, the total for 2016 is £1,380/$1,980. WASAT– This has 6 classes of the primary school, with 1 government teacher, and 4 supported by Trinity. It would have to shrink to ECD and only class 1. The total for the school each month is £80/$120, and for 2016 is £960/$1,440. KAPKAGHUN– This is a full primary school with 8 classes, only 2 government teachers, and 4 supported by Trinity. We also support a cook. We will to have only the ECD and first 2 classes. The total for the school each month is £100/$140, and for 2016 is £1,200/$1,680. KAPKEWA– This is a full primary school with 8 classes, 3 government teachers, and 4 supported by Trinity. We would have to have only the ECD and the first 3 classes. The total for the school each month is £85/$120, and for 2016 is £1,020/$1,440. KAPTEREMA– This is a full primary school with 8 classes, 4 government teachers, and 3 supported by Trinity. We would have only the ECD and the first 4 classes. The total for the school each month is £70/$105, and for 2016 is £840/$1,260. KASEPA– This is a full primary school with 8 classes, 3 government teachers, and 3 supported by Trinity. We would have only the ECD and the first 3 classes. The total for the school each month is £80/$120, and for 2016 is £960/$1,440. CHEPKINAGH– This is a full primary school with enough government teachers to keep the school ticking over. We have been supporting 5 teachers and a matron at £150/$215 each month, and for 2016 it would be £1,800/$2,580. KAMKETO– This is a full primary school with enough government teachers to keep the school ticking over. We have been supporting 3 teachers and a matron at £90/$130 each month, and for 2016 it would be £1,080/$1,560. KASEI– This is also a full primary school with enough government teachers to keep the school functioning. We have been supporting 2 teachers and a matron at £80/$120 each month, and for 2016 it would be £960/$1,440. KASEI SECONDARY– This is a full secondary school, forms 1-4, and has enough government teachers to continue. We have been supporting 2 teachers as a church at a total of £150/$220 each month. KAMKETO SECONDARY– This is a new school with only the first 2 forms, with only 1 government teacher, and 2 supported by Trinity. We must continue to support at least 1 for the school to survive, at £75/$110 each month. If 40 people or churches supported just one teacher at £30/$45 each month, starting January 2016, then this work can continue uninterrupted. Apur, Kapkoghun, Kapkewa, Kapyomot, Kwirir, Tadakit, Wasat. Funding remains urgent for Kapterema (£70 per month) and Kasepa (£80 per month). This section will be updated as and when commitments to help are made. We have recently learnt of the sudden and unexpected death of Peter Kivati in Nairobi. It was planned that he would go and serve in Rendille. Please remember our brethren in prayer at this difficult time. At the present time there are insufficient funds available to be able to provide for all the teachers that are needed in the schools that Trinity Baptist Church in Nairobi sponsors in Pokot North. Keith has now returned to live in England, but for the present has been asked by Trinity Baptist Church in Nairobi to continue as an elder. He and Priscilla are now living in Liverpool. Keith intends to make regular visits back to Kenya to visit the brethren in different places there and to teach the PTC. He will no longer be sending his newsletters through Keith Weber. We will continue to add them to this website. If you wish to continue to receive information for prayer directly then please contact Keith at kunderhill@digitalsavannah.co.uk and request to be added to the mailing list. We have received the following urgent needs relating to particular people. If you can help in any way then please contact us. 1. D I. His mother is widowed and supported by us in Korr (Rendille). We have agreed for him to do a post-secondary course in Food and Nutrition so as to get a job and hopefully be able to take care of his mother. Since it is here in Nairobi we not only have fees but also living and transport expenses (He presently stays in the church compound). 2. A H. His mother is a church member here in Nairobi, but single, with husband having left her. We are hoping he will be taken in the Government Utalii College to study catering. He is presently working in the butchery of my fellow elder Eric Abwao and is proving very responsible. We again feel we have to do this so that he can eventually support his family. The course over 18 months is about £800. 3. S H. A H’s brother, in Form 3. We are sending her to Rafiki School (cost about £300 a year) because of problems we see in the Parkland Arya Secondary. It is probably cheaper but because Rafiki will be a day school, S, her mother and siblings will need to rent a couple of rooms nearby. Note: Rafiki is a truly Christian and reformed School. A number of their staff now attend on Sundays, and a number of our children are going there, including Murungi’s, Abwao’s and a Deacon’s. 4. Sh H. The other sibling of A H’s who were are also sending to Rafiki at about £300 a year (she is in Standard 7). Before she was in Isiolo, at a Muslim primary school, and staying with Muslim relatives. We all found this situation intolerable. We are hoping that the mother, D, might get a job at Rafiki, for which she has applied, and then she could at least help defray expenses. 5. P K. He is the oldest son of one of the evangelists in Korr, Godana. He has been accepted at Kericho Teacher Training College, and has just informed me that fees for the 1st. of 2 years are Kshs. 80,000 (£550). He is also wants to train so as to teach and lift his family out of poverty. In 2014 we were able to raise a substantial amount towards the £10,000 needed to set up the new girls’ secondary school in Kamketo. We also received a legacy of £10,000 which is being used towards completing the new church building at Kasei (Pokot North), completing the church building at Korr (Rendille), building a permanent house for one of the faithful labourers in the gospel in Ndikir (Rendille) and towards the completion of the new girls’ secondary school at Kamketo.